One Direction spent the day with a number of sick children at a London hotel last week. The pop group teamed up with Rays of Sunshine, a charity which grants the wishes of seriously and terminally ill children. According to ContactMusic.com, members of the band spent time with 7-year-old burn victim Niamh Wyle, nine-year-old Grace Millar, who has undergone a liver transplant, and nine-year old leukemia patient Eve Kelly. "It's such a small thing for us but the kids get so much out of it. We really love doing things like this. We leave smiling because they are always so wonderful," said Liam Payne. 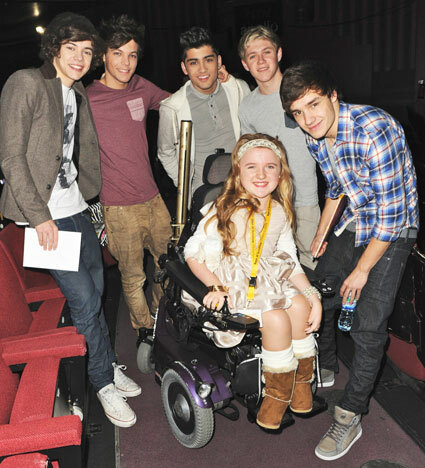 Bandmate Niall Horan added, "It is totally humbling to meet kids like this. And it really makes you feel good that you can do something nice for them. We've had amazing good luck and many of these children haven't. But they are always happy and we go away feeling brilliant. It's like we're giving something back."